Hi All! Well, while trying to take all my indoor plants outside for the summer, and at the same time trying to keep my cat from 'escaping' and going outside, I managed to slam my index finger in the door and now I can't type. Its driving me crazy, because I can type at least 90 words a minute, and now its about 5 words a minute with lots of errors. UGH! Its all black and blue and it really, really HURTS!!!! That DARN cat! LOL! I even had to work last night. Try cutting fabric and/or putting it away without a index finger. I must have screamed 'ouch!' a half dozen times! Anyway, enough of my silly complaints, onto my card for today. I made this card for two challenges: Today's Inspiration Challenge and this week's Crafty Secrets Challenge: both on Splitcoaststampers. The Inspiration Challenge today was Book Covers. 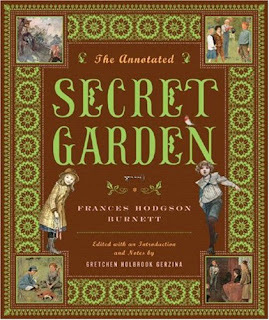 I picked 'The Secret Garden' because the images reminded me of the images in the Crafty Secrets 'Garden Girls' set, and I'm a Gardener, AND I love that story. The Crafty Secrets Challenge was to have a pocket on your card, so I just made a Trifold Pocket Card. The designer paper is Stampin Up! 'Berry Bliss', and the card stock colors are Pretty in Pink, Confetti White, Chocolate Chip, and Close to Cocoa. The images were all colored with Prismacolored Pencils and Gamosol. Merry Christmas in May! LOL! As most of you already know, I am a member of the Christmas Challenge Club on SCS. We make our Christmas Cards all year long so that we don't have to make them all at once in November or December. I challenged myself to make 5 Christmas Cards a month, so I will have about 60 Christmas Cards at the end of the year. I've already shown you two of those Christmas Cards in a previous post, so here are the next three. The first card uses this week's Sketch Challenge on SCS. And my, what a challenging sketch! Lots of layers! I chose a monochromatic color scheme to help make the card look less busy. All the designer paper is from the same stack of 'Bashful Blue' Designer Paper from Stampin Up! The other card stock colors are White and Bashful Blue. This card is so much prettier in real life because I covered each and every dot on the designer paper with Stickles so its very, very sparkly. The snowflakes are Cuttlebug Die Cuts. The image is retired Stampin Up! 'Winter Play' and is colored with Copic Markers. The sentiment is from Stampin Up! 'Baby Jesus is Born'. Both the image and the sentiment are mounted up on dimensionals. My second card uses this week's sketch challenge on Paper Craft Planet. The sketch actually had a big star on it, but I changed the star to a Sizzix Gingerbread Man Die Cut. The paper is Stampin Up! 'Holiday Treasures' Designer Paper. Card Stock colors are Old Olive, Close to Cocoa, Chocolate Chip, Kraft, and Real Red. I used a white gel pen on the hearts and to doodle on the Gingerbread man. I used a Sizzix Die for the photo corners. My final card is for this week's Technique Challenge on Splitcoaststampers. This is called a 'Hinged Card'. It was so fun and easy to make. The top lifts up to reveal the sentiment inside. The directions on how to make this card are on the SCS website. If you can't find it, let me know and I'll email you a link. I used the same 'Holiday Treasures' Designer Paper from SU! on this card, plus Olive Green, Riding Hood Red, and White Card stock. The image is retired Stampin Up! 'Festive Friends' and the inside sentiment is from 'Sparkling Season'. Today I have two cards both made with Crafty Secrets Stamp Sets for two different challenges. The first card was made for the Crafty Secrets Challenge on Paper Craft Planet. It was suppose to be a Limited Supply Challenge. We were only suppose to use 1 image, 2 different designer papers, and ONLY 3 Embellies. Well, I don't do well with limitations, I NEVER play the Limited Supply Challenge on Splitcoaststampers, but my good friend Darlene was hosting this challenge, so I had to try. But, as always, I failed. I ended up using 8 embellies. I'm so naughty. I just couldn't bear the thought of not adding more embellies to a Crafty Secret Card. The images are made to be layered and embellied! But Darlene forgave me. Sorry Darlene, I'll try harder next time! LOL! Now, onto the details of the card. The image is from 'Garden Girls' and is colored with Prismacolored Pencils and Gamosol. The Designer Paper is DCWV 'Garden Party' Stack. Card stock colors are Pretty in Pink, White, and Chocolate Chip. I put Stickles on the little girl's necklace and the the first letter of each word. The butterflies are cut out from the designer paper in the 'Garden Party' stack and are very glittery in real life. My second card I made for last week's challenge on Splitcoaststampers. We were challenged to put as many circles on our card as possible. I used the image from 'Sweet Kids' and colored it with Prismacolored Pencils and Gamosol. 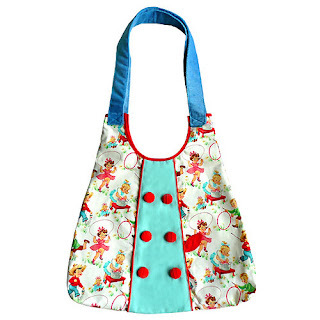 The Designer Paper is from DCWV 'Nana's Nursery: Baby Girl Stack'. Card stock colors are Regal Rose and White. My circles are in both of the designer papers, the brads, the umbrella in the image, all the Nesties, AND I even put the sentiment in a circle in the inside of the card. Is that enough circles? LOL! The Digital Tuesday Challenge this week is to make a wedding card or project using your digital images. The sponsor this week is Dustin Pike. He is giving away three images to one lucky random-drawing winner. You can see Dustin's images here: http://dustinpike.blogspot.com/ Also, if you've never tried digital images before, Dustin has A LOT of free digi downloads on his blog. Why not pay him a visit and try one out? For my card, I used one of Dustin's newest digital images. I colored the image with copics and mounted the main image panel up on dimensionals. There are stickles on the bear brides garland and flowers. The sentiment tag is a Cuttlebug Die. The paper is DCWV designer paper, and pretty in Pink, Certainly Celery, Regal Rose, White, Close to Cocoa, and Chocolate Chip Card Stock. I used two different types of ribbon and brads for embellishment. I hand-doodled around the card with a gel pen. If you'd like to play along with us on the Digital Tuesday Challenge, simply click on the blinkie in my sidebar and it will take you directly to the blog. You have one week to make your project and link it to the DTC blog to be eligible for the free drawing. Happy Memorial Day everyone! Its a beautiful spring day here in Wisconsin. I hope to make a quick post, hopefully get to make one card and spend a little time in my garden, and then I'm off to a Barbecue! For today's post, I'm featuring two cards I made for two separate Featured Stamper Challenges on Splitcoaststampers (SCS). I chose to case Christmas Cards, because as most of you already know, I am in the Christmas Card Challenge Group on SCS. In this group we make several cards a month all year long so we don't have to make 100 Christmas Cards in December! My first card is for FS119 Joan Ervin. Her original card can be seen here: http://www.splitcoaststampers.com/gallery/photo/1168200. I changed everything but the layout/concept. The designer paper is very glittery and is from 'My Minds Eye'. Card stock colors are white, Sage Shadow, and Ruby Red. The sentiment is retired Stampin Up! 'So Many Scallops'. The main image is a digital image from 'Fred, she said' and is colored with Copic Markers. I put stickles on the snowflakes, liquid applique on the rim of the hat, and I added a 'puff' to the tip of his hat. My second card is for this week's Featured Stamper mkstampin74. Her original card can be seen here: http://www.splitcoaststampers.com/gallery/photo/1167186 Again, I changed everything but the layout/concept. My designer paper is from My Mind's Eye. The card stock colors are White, Soft Sky, and Sage Shadow. The main image is also a digital image from 'Fred, She Said' and is colored with Copic Markers and mounted up on dimensionals. The snowflakes are a Martha Stewart Punch with a crystal brad adhesive attached to the center. They are also mounted up on dimensionals. I used liquid applique on the girls coat and hat, and added a 'puff' to the end of the hat. Stickles were added to the snowflakes in the image, and the designer paper is also very glittery. I used my sewing machine on both cards too! Today's post is all about my mid-spring garden, so if flowers aren't your thing, you might want to skip it, but if your madly in love with flowers and gardens like I am, you don't want to miss it! I promised my readers that I would post pictures of garden as it changes throughout the growing season. I've already posted a few pictures of my Early Spring Garden when all the daffodils were in bloom. This post is all about my Mid-Spring Garden. There isn't much in bloom now, yet its still so beautiful since everything is starting to burst forth into life and looks so fresh and new. The bugs and the heat of the sun have yet to cause any damage. The first picture is a view of my Western Garden. This 'hill' is actually my septic mound and is mostly covered with creeping phlox and other ground covers. My husband had a hard time mowing this steep mound, so we removed the grass and covered the slope with ground covers and the top of the mound with perennials. The second picture is of my Southern Hillside. Another steep hillside that is covered with iris, cat mint (the blue flower), phlox, and rudebekias, among other flowers not mentioned. The third picture is of some Cat mint and Cushion Spurge. The fourth picture is the top of the septic mound. The fifth picture is a faraway shot of the Southern Hillside Garden and the main garden below. The glass building with all the windows is my sun room that my husband built for me. This is another view of our septic mound garden, and below is a close-up of Leopards Bane. I use to know the names of every single plant in my garden, but unfortunately my memory is starting to fade and I can't even remember the name of this beautiful little yellow flower. Does anyone else know what it could be? Here is a picture with the creeping phlox on the septic mound in the background, and a tree ring of hostas just beginning to poke out of the ground. Later in the summer when I show you pictures of my garden the hosta will be so big and thick you won't be able to see the ground. Here is a close-up of a White Bleeding Heart. Here is a close-up of more cat mint and a purple allium. Here's that little unknown yellow flower again: is it Allsym? I think that's it. Maybe my memory is coming back to me after all. LOL! The other plant is a Sedum. And another picture of the Purple Allium For my non-flower gardeners, this flower is actually in the onion family. Its a wonderful flower to grow if you have pesky deer, rabbits, and voles....they stay away! They don't like the taste or the smell! This is a view of my lower, main garden and garden shed as seen from my back porch. This is the view from my back porch looking East. Here is a close-up of my Honey Locust tree...one of favorite trees! This view is seen from my front porch. That's the entire septic mound below. Here is a close-up of my favorite tree in my yard. The very first crab apple tree we planted. It has visual interest all year round. In the spring I have these gorgeous blooms, in the summer the leaves are a beautiful burgundy, and in the fall and throughout the winter its covered with huge, beautiful, red berries. Then early in Spring when the robins arrive they eat every single berry off the tree. I've seen as many as twenty robins in the tree at once. Its so funny because one minute the tree is covered in berries, and the next minute, they are all gone! This is another close-up of the crab apple tree and the final picture of my mid-spring garden. Well today I'm off to my local consignment store to drop off the Father's Day Cards I made, so I thought I'd better post them while they are still in my possession. I actually made twelve Father's Day Cards, but I'm only posting six because the other six were directly cased from the Splitcoaststamper's Gallery. When I have to quickly make cards, I case them from a gallery because its faster to bounce off another person's idea then to try and create something totally original. I always end up changing something, I never have the same paper or embellies as the original artist, so my cards always look slightly different. These cards I'm posting today however, are all my own design with the exception of the layout of the 'Loads of Love' and 'Thoughts of Father' cards. The very first card uses a train image from a retired Stampin Up! set 'All Aboard'. The sketch is this week's sketch challenge on SCS. The sentiment is from Clear Dollar Stamps. all the paper is unknown designer paper sponged with Close to Cocoa ink. I also used Chocolate Chip and Close to Cocoa Card Stock. My second card, I don't like at all, but I'm sure it will be the first one to sell. I live in Wisconsin, and EVERYONE, and I mean EVERYONE is a die-hard Green Bay Packer football fan. Sunday afternoons the entire state looks like a Ghost Town because everyone is either at home or in a bar watching the game, except me of course. I hate sports. I find it the perfect time to go to shopping because all the stores are empty. LOL! And don't even get me started on the Brett Farve controversy. Ugh! All I have to say about that is: 'Grow up Brett!'. LOL! Anyway, my card uses the retired SU! Stamp Set 'Just Football'. I stamped the helmet twice. Once in black ink and once in yellow. I cut out just the helmet of the yellow image and attached it to the black image. Then I added a brad and stamped a 'G' on it. It is also mounted up on dimensionals. Card stock colors are Summer Sun, White, and Garden Green. My third card is from Stampin Up! 'Loads of Love' and IS NOT RETIRED! Yippee! You can still buy this set! I paper pieced the truck and mounted it up on dimensionals. The sentiment is also from Clear Dollar Stamps, and I'm sorry, but I can't remember where the designer paper is from. Card stock colors are Bashful Blue and Going Grey. My Fourth Card uses one of my favorite images from Art Impressions. The 'Blue Jean' Designer Paper is unknown. The image is colored with Copic Markers. The sentiment is from Clear Dollar Stamps. The tool embellishment I picked up from my local consignment store...isn't it cute? I used a Cuttlebug Folder on the Summer Sun panel and sponged it with More Mustard ink cause it was a little too bright for my taste. I then finished the whole card off with some hemp. The fifth card uses an image from 'Set Sail'. Again, its retired Stampin Up! If you ever see a retired image that you really like, just send me an email and I'll be happy to stamp off some images for you. You can also find a lot of retired Stampin Up! sets on Ebay. Thats where I got most of mine. I added a lot of texture to this card by Cuttlebugging (that's a new verb I created! Do you like it? LOL!) the Close to Cocoa and Old Olive layers with Embossing Folders 'Divine Swirl' and 'Mesh'. I also tore, and distressed every panel too. The other Card Stock colors I used are Brocade Blue and Naturals Ivory. The image is colored with Prismacolored Pencils and Gamosol. I mounted the sentiment up on dimensionals and added hardware and hemp for embellishments. My final card uses a CURRENT image from SU! called 'Thoughts of Father'. I just love this picture of an old car in a bed of flowers. I've often told my husband that I would love to find an old, beaten up old truck and put it in my yard and fill it with flowers. He of course thought that was a ridiculous idea and told me it would never happen. But he usually thinks all my artistic ideas are ridiculous until I disobey him and do it anyway and then he actually 'sees it'...then he likes it. He just doesn't have the vision. LOL! Anyway, I used a retired SU! background stamp for the top of the card, and the bottom of the card is just Naturals Ivory and Old Olive Card Stock. I used Brocade Blue Card Stock as my base. I sponged the main image panel and the Naturals Ivory Panel. The main image is colored with Prismacolored Pencils and Gamosol and is mounted up on dimensionals. This is a card I made for two challenges on Paper Craft Planet: the weekly sketch challenge and the Crafty Secrets Challenge. This week Darlene's Challenge was to use your Crafty Secrets Products with the weekly PCP sketch challenge. I liked that idea! Combining challenges is my favorite thing to do! Saves a lot of time! LOL! To make my card, I used Certainly Celery, Regal Rose, White, and Very Vanilla card stock. The designer paper is all DCWV 'Nana's Nursery: Baby Girl Stack'. I'm just in love with that pack of designer paper, and will have to buy more. I don't even make baby cards with it! They are just such soft and pretty patterns, they make a great background for cards with vintage images. Anyhow, back to my card. I cut out and mounted up on dimensionals the girl and the watering can. The image is colored with Prismacolored Pencils and Gamosol. Those are small heart brads in the right and left corners. The finishing touches are vanilla organdy ribbon and a organdy adhesive flower. All the images are from Crafty Secrets 'Garden Girls'. Oh, I tell you, I've just been going and going lately. I'm off to work again today in just a couple of hours, and on Thursday I'll be bumming around with hair and lunch dates, and on Friday I work all day, Saturday I have a shopping date with my daughter and a graduation party to attend...blah, blah, blah, I know, I'm such a whiner. I have such a wonderful life, I shouldn't be complaining. But I'm just one of those people that if life gets too 'busy' and I don't have enough 'time alone at home' I get cranky. I've been really 'snappy' with my family lately because of it, and I shouldn't be. Its just hard for me to fit in all I want to do in one day. I like to work, cause I like the extra 'play' money, but I also like to be at home to craft/garden, and its hard to do both plus take care of the house and kids. So I'm just feeling a bit overwhelmed. I think I've realized I just need to stop picking up the extra shifts and just work about 12 or 15 hours a week and that's all. And least during the summer months. During the winter months, I can work more and handle it, but not during the summer. Here is the card I made for the blog Digital Tuesday Challenge . The challenge this week is to use your Digital Images and make a card or project that has at least one tag on it. I made a pocket card, and inside the pocket is a tag. The digital image is from Fred, she said', and you can find the store here: http://fred-she-said-store.blogspot.com/ I loved Tracey's Digital Images so much, I just purchased three more from her yesterday. To make this pocket card, I used Wild Wasabi as my card base. If you've never made a pocket card before, there is a wonderful picture tutorial on Splitcoaststampers. Just click on the link in my sidebar and it will take you to the site. The designer papers are from DCWV 'Summer Stack'. The image is one of Tracey's newest digital images called 'Emma and the Butterfly'. I cut it out and mounted it up on dimensionals. The butterfly on the tag is from MyGrafico. The sentiment is from Inkadinkado; the only non-digital image on my card. If you'd like to play along this week, just click on the Digital Tuesday Challenge Blinkie in my sidebar and it will take you there. The winner, chosen randomly, will receive three digital images from Fred, She Said. I've worked so many hours this week, I haven't been able to spend much time in my craft room. So for today's post, I will show you a card I made for my daughter's fiancee who just graduated from college. I had to wait to post it till after he received it. The images are from the retired Stampin Up! set 'Tassel Time'. I cut the top layer of the card 1 inch shorter than the bottom layer, so the sentiment is actually stamped on the inside of the card. I'm off to work again today. And I work a terrible shift: 12:45 to 9:30. Its going to be a long, long, day. And Mondays are usually very slow, which will make the day seem even longer. UGH! Today I worked the 'trucking' shift at work, so I'm first getting around to posting now. I don't normally work the trucking shift because I'm not on it. Those ladies have to be at work by 6:00 a.m. and they unload the big semi's and put the product on the shelves. I'm usually working the cut counter or the cash register, so I never have to show up before 8:30 a.m., but one of the 'truckers' couldn't work her shift and asked me to fill in for her. Although I did enjoy doing something different for a change, I did NOT enjoy waking up at 5:00 a.m. and wouldn't want to do that job on a regular basis. I'll stick to cutting fabric. LOL! And now for my card for today. I made this card for two challenges on Splitcoaststampers: the Sketch Challenge and the Crafty Secrets Challenges. For the Crafty Secrets Challenge we had to make a card that had either a flower or 'flour' on it. I chose flowers since my local scrap booking store sold out of the Crafty Secrets new cooking stamps already. Darn it! LOL! To make my card I stamped and cut out the image from 'Bouquet of Joy'. It is colored with Prismacolored Pencils and Gamosol. All the designer paper is from DCWV 'Nana's Nursery: Baby Girl Stack'. I made this card for this week's Featured Stamper Challenge on Splitcoaststampers. This week's Featured Stamper is the amazing dbdoodle. Her original card can be seen here: http://www.splitcoaststampers.com/gallery/photo/1039961?cat=500+ppuser=88674 I kept the exact same layout and concept, I just changed the image, colors, and papers. My image is from Digital Stamp Oasis and is colored with Copic Markers. The papers are from DCWV 'The Grade School Stack'. The Card Stock colors are White, Black, and Hunter Green. The ruler is a sticker, and I used my sewing machine to sew on the card. Sorry I've been MIA for a few days. I picked up some extra shifts at work and have been working non-stop. Now I have a few days off before I have to go back to work again. I was hoping to work in my garden today, but it appears Mother Nature has other plans for me: its raining. Oh well, time to play 'catch-up' in my craft room! LOL! Anyway, onto my card. I made this card awhile ago for the Paper Craft Planet Sketch Challenge a few weeks back; but I was waiting to post it on my blog because I wanted to post it with my Digital Tuesday Challenge card I posted yesterday. But I forgot. So here it is today. The images are from the same Digital Stamp Set from MyGrafico I used for yesterday's card. I stamped little stars in Versamark on the Night of Navy card stock. The other card stock colors are So Saffron, Ballet Blue, and White. The astronaut is mounted up on dimensionals and all the images are colored with Copic Markers. After I completed this card, my son informed me that I spelled 'Your' wrong, but I wasn't about to tear it off and start over, so it is what it is. Next time I use a computer to create my sentiment, I will have to have my son check the spelling and grammar BEFORE I print it. LOL! Isn't it wonderful when your own children are smarter than you! Edited to add: I just found out that I won last week's sketch challenge on Paper Craft Planet for this card. I won a free Digi Stamp Set from MyGrafico. Wow! I feel so blessed and honored. This is the second time I've won the sketch challenge on PCP! Thank you!